WACO — After the start of its game on Saturday was delayed nearly three hours by weather, Texas stormed back from a five-run deficit at Baylor Ballpark. Baylor jumped on UT starter Blair Henley in the opening inning on Saturday. The first four Bear batters registered a hit, and Baylor pushed across three runs in the inning. Baylor later got two run-scoring doubles in the fifth frame, but that 5-0 lead would not stick. 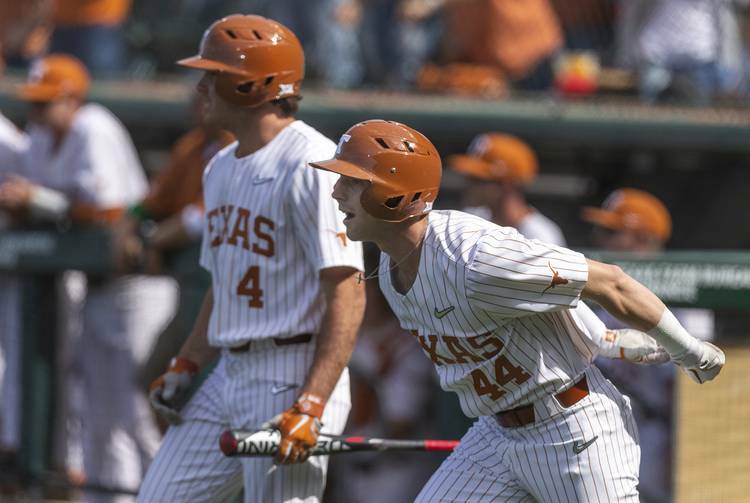 Austin Todd got UT on the scoreboard with a two-run homer in the sixth inning, and the Longhorns scored seven times over the sixth and seventh sessions. In the final frame, Lance Ford added a RBI double to a night that included a two-run single and getting hit by a pitch with the bases loaded. The lead change made a winner of Henley and Kamron Fields earned the save. Sophomore Tristan Stevens also recorded a huge strikeout in the eighth inning. With the win, Texas evened its conference record. Ranked 12th in the D1Baseball poll on Monday, the Longhorns (21-13) are now 4-4 in Big 12 play. The loss dropped Baylor (22-8; 6-2) into a first-place tie with Oklahoma State in the Big 12 standings. To end the third inning, Baylor left fielder Cole Haring made a leaping grab of a ball hit by Todd. The baseball may not have cleared the fence, but the catch certainly robbed Todd of extra bases. Three innings later, Todd took Haring’s glove out of the equation with a blast to left field. The homer was the fifth of Todd’s career. He has gone deep three times this season. NOTABLE NUMBER: 4. For the fourth time in its last six games — and third straight contest — Texas started a different player at designated hitter. On Saturday, freshman Peter Geib got the nod. Geib only had six at-bats ahead of Saturday’s game, but a second-inning single will go down as the first of his collegiate career. Geib finished the game with two hits. Geib hails from Houston and is a graduate of Bellaire Episcopal. He is a former high school teammate of UT catcher Turner Gauntt. UP NEXT: The Longhorns will head back to Austin following Sunday’s series finale against Baylor. Texas will send RHP Coy Cobb (0-2; 3.16 ERA) out to oppose Baylor RHP Hayden Kettler (2-2, 4.24). A freshman, Cobb is coming off a performance in which he worked seven innings and struck out a career-high eight batters.